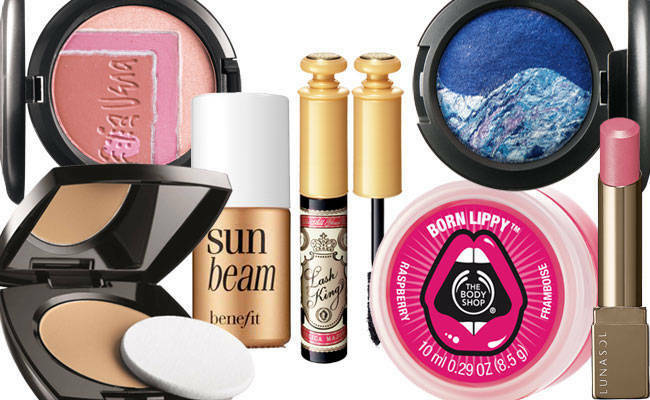 Click through the loot you need to recreate summer's makeup trends, with tips and tricks from a makeup expert. Complement your summer outfits with the season's hottest makeup trends. To learn what they are and how to achieve them, Cosmo.ph caught up with MAC's senior makeup artist, Nicole Thompson, who shared valuable and easy-to-follow beauty advice and tricks. One of the top beauty concerns of busy working girls is how to achieve flawless-looking skin in the least amount of time possible before they rush to work in the morning. Nicole suggests applying primer right after your moisturizer, starting from the center of your face and spreading outward. Then, add dewy makeup like MAC Strobe Cream on just the outer areas of your face. Finish with a quick buff of foundation using a soft brush like MAC 168, and you're perfectly glowing. Another expert trick for shortening your makeup routine is using products in a variety of ways: lipstick on your eyelids and cheeks; eyeliner around your lips; and lip liner around your eyes. Look 1: Nouv-Eau: Perfect the classic, minimalist makeup look with these simple steps. First, dust your face with powder in your skin tone, like those in the MAC Mineralize Skinfinish line, for coverage that looks like second skin. Then, emphasize your brows, keeping the look strong yet natural (try MAC Lingering Brow Pencil). Stain your lips with a pink lip cream and use the same shade on your cheeks. (Hint: Any lipstick can double as blush; just remember to keep it sheer.) Then, create a light smoky eye by dusting one shimmering shade right up to the brow and adding dimension with a soft smudge of colored shadow. Tip: Blend with a soft brush (like MAC 217) and dust powder to set your makeup (try MAC Extra Dimension powder) for an all-over radiant complexion. Look #2: Ore-Inspired: Emulate the golden glow of beauties like J.Lo and Kim Kardashian by enhancing your summer tan. Contrary to popular opinion, metallic finishes are not just for clubbing--you can absolutely wear them on the beach for a luxe look! To achieve this, apply brilliant eye shadow on your lids, like MAC's Metal-X cream eyeshadow (which also works as highlighter for your cheekbones and the bow of your lips!). Sweep the Red Hot Copper shade on top and underneath your peepers. Define your eyes with pencil liner to prevent fallout. Dust gold powder around your face, especially on the apples of your cheeks. Then, finish with lipstick in a dark matte shade like MAC Diva. Dab clear gloss on top for added effect. Tip: When it comes to makeup tools, look for soft brushes if you need less product. If you need a denser finish, use your fingertips to press on a stronger shade. For your lips, prep your lip brush with lip conditioner before swiping on lipstick. Look #3: Neo-N: The color-blocking trend has migrated from runway clothes to real-life makeup! This season is all about vibrant colors, so don't be afraid to wear strong lip shades, as seen in Jason Wu's summer collection. MAC's Pink Nouveau and Prolong red lip colors not only give your puckers the hottest of hues, they can also be used as blush. Highlight your best features with shimmery gold powder, and be sure to leave your brows bare to keep the look balanced. Tip: Brush a tiny amount of lip conditioner on your brows to make them glisten subtly. Interested to try out these tips and cop the looks? Launch the gallery to see over 60 new products you can play with this summer! MAC is available at Power Plant Mall, Shangri-La Plaza Mall, Glorietta 3, and Rustan's The Beauty Source. Estee Lauder is available at Rustan's Makati, Rustan's Shangri-La, Rustan's Alabang, Rustan's Gateway, Rustan's Cebu, and Rockwell Essenses. Lunasol by Kanebo is available in Rustan's Department Stores. Benefit is located in Greenbelt 5. Majolica Majorca is exclusively available at Watsons and SM Department Stores nationwide. Lancome is available at Rustan's Marrionaud and the Greenbelt 5 Fashion and Lifestyle Center. The Body Shop has stores in Alabang Town Center, Eastwood Mall, Gateway, Glorietta, Greenhills Shopping Center, Greenbelt, Market! Market!, Power Plant Mall, Robinsons Place Ermita, SM City Marikina, Robinsons Galleria, SM Makati, SM Mall of Asia, SM Megamall, SM North-The Block, Shangri-La Plaza Mall, Sta. Lucia, The Podium, TriNoma, Marquee Mall, SM City Baguio, Ayala Center Cebu, SM City Cebu, SM Cagayan de Oro, and SM City Davao. Pond's and Max Factor are available at leading department stores nationwide.